Once again we hit the road this week, this time taking Civil Service Live to St James' Park in Newcastle on the hottest day of the year so far. Highlights included a highly interactive session on emotional intelligence and the Future Coastguard Programme, as well as the ever-popular spot mentoring sessions in the executive suites overlooking the pitches. As ever, you can find all the reaction to the day on our Storify and Flickr pages. Away from Civil Service Live, civil servants were out and about in force. The Civil Service Diversity and Inclusion Team won the 'Overall Award for Public Sector Employer of the Year' at the employers network for equality and inclusion (enei) awards, and the Civil Service Rainbow Alliance posted a report from their day marching at London Pride. Also big this week was a post by Simon Fraser, Permanent Under Secretary, Foreign and Commonwealth Office, who offered his thoughts on what makes a good leader which got the comments thread humming all week. Don't forget nominations close 25 July 2014, so get your applications in. 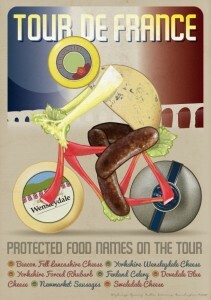 And if that wasn't enough, they've also built an interactive map of all the Protected Food Names in the United Kingdom. Great if you plan your holidays around food. I'm so glad you enjoyed my highly interactive session on Emotional Intelligence. You were a great audience and I was touched by the warmth of the reception I received. Philip Gimmack, EQworks.co.uk. Just found this post. I was responsible for the 'infographic of the week'. I work for the Highways Agency and our Media Services team has been contributing graphics support for the likes of Defra, DECC, OLEV, MCA and numerous other agencies as part of the Safety and Environment Marketing Hub. 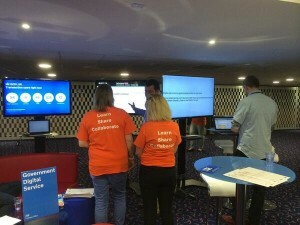 This free service was in response to the govenrments call to share services and we've had great insight into how all these departments communicate and embrace the new digital by default message. Defra's brief was open and I was extremely lucky to get the opportunity to be as creative as I could be. To top it all I also got to dabble in my own google maps hobby and prepare the custom marker pins for their interactive map. Thanks for the recognition.